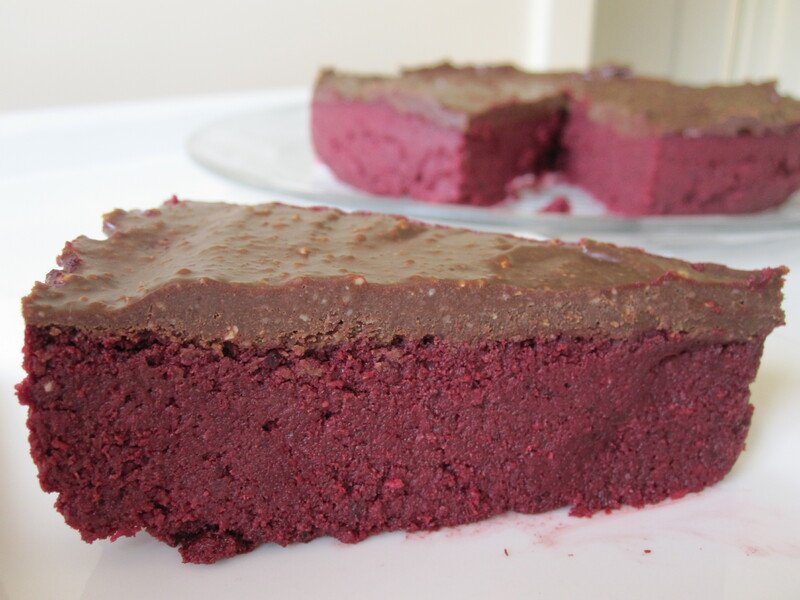 I’ve seen a few different recipes for a chocolate beetroot cake – mostly cooked ones but when I found this raw one I had to give it a go. A couple of slight modifications and I reckon this is pretty darn good! Oh and it got the clean plate of approvals from the whole family and why wouldn’t it sweet and chocolaty and oh so moist! In a food process, process together the dates, currants and maple syrup until they form a paste. Add the remaining ingredients and process until you have a very fine texture – this may take a few times of stopping the processing, scrapping down the edges and re-processing. Line a round spring-form tin with baking paper. Spread the mixture over the bottom and press down until even. Place in the freezer while you prepare the chocolate icing. Combine all ingredients – except the cacao butter in a processor until well combined and smooth. While the processor is on, drizzle in the cacao butter and stir until combined. Pour icing over the cake base and spread ‘lusciously’.